Punxsutawney, Pennsylvania, is a quiet rural community ninety miles northeast of Pittsburgh, where routes 36 and 110 intersect. On February 2, all eyes are on this town, waiting for an unlikely critter to predict whether the second half of winter will be blustery or mild. The legend of Punxsutawney Phil is tied in with the Native Americans, the German settlers, and the Roman Catholic tradition. It was 1723 when the Delaware Indians settled in Punxsutawney. In their original creation belief, their forebears began life as animals in “Mother Earth” and emerged centuries later to hunt and live as men. Their legend of “Wojak, the groundhog” informs us that they consider this rodent to be their ancestral grandfather. The Germans migrated into western Pennsylvania in the 1700s. They brought with them two traditions, Candlemas Day and mid-winter weather predicting, both celebrated February 2. Candlemas day is the last Christmas celebration of the holiday season. According to Mosaic law, a woman giving birth to a son was unclean for forty days (if she birthed a daughter, she was unclean for eighty days). During her time of uncleanliness, she could not go to the Temple. When her time was spent, the mother took her baby and an offering to the Temple for a purification ceremony. Thus, Mary took Jesus to the Temple on February 2, where she redeemed her son and was purified by the prayer of Simeon the just in the presence of Anna the prophetess. In Christianity, this is known as the Purification of the Blessed Virgin, and they celebrate the Feast of the Presentation of Christ in the temple (Leviticus 12:2-8; Numbers 18:15; Luke 2:22). It became a Candlemas tradition for clergy to bless candles and distribute them to the people, who placed a lit candle in each window of their home on this dark winter day. Thus, if it the sun appeared on Candlemas day, the bear would cast a shadow, predicting six more weeks of blustery weather. For some unknown reason, the Germans replaced the bear in their tradition with the groundhog, another hibernating creature. Other ditties were written for this day. Punxsutawney’s fame began on February 2, 1886, when the Clymer Freas, editor of The Punxsutawney Spirit, proclaimed: Today is groundhog and up to the time of going to press the beast has not seen its shadow. 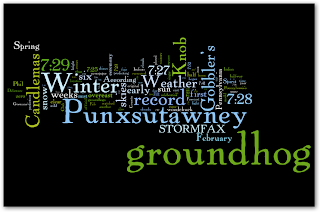 The groundhog was given the name “Punxsutawney Phil, Seer of Seers, Sage of Sages, Prognosticator of Prognosticators, and Weather Prophet Extraordinary.” In his first performance, he did not see his shadow, predicting an early spring. The following year, on his first official trip to Gobbler’s Knob, he did see his shadow. Last year, 2008. amidst fog and mist, a crowd booed as Punxsutawney Phil predicted six more weeks of winter. The tradition of Punxsutawney Phil has spread across national lines. For example, in 1956 Wiarton Willie, in a town of Wiarton in Canada, made his appearance. Ontario has Gary the groundhog; Manitoba has Brandon Bob and Alberta has Balzac Billy. Nova Scotia has Schubenacadie Sam, who is the first groundhog to see (or not see) his shadow. By the way, a groundhog’s a.k.a. is woodchuck. Which raises the question: How much would could a woodchuck chuck if a woodchuck could chuck wood? Answer to the riddle: A woodchuck could chuck 318 Kg. of wood if he could chuck wood.